The founders of the Fabergé jewelry house were a family fleeing from religious persecution in France. They first found refuge in Pärnu, but then moved on to St. Petersburg, where in 1842, Gustav Fabergé (1814-1893) opened a small basement workshop. 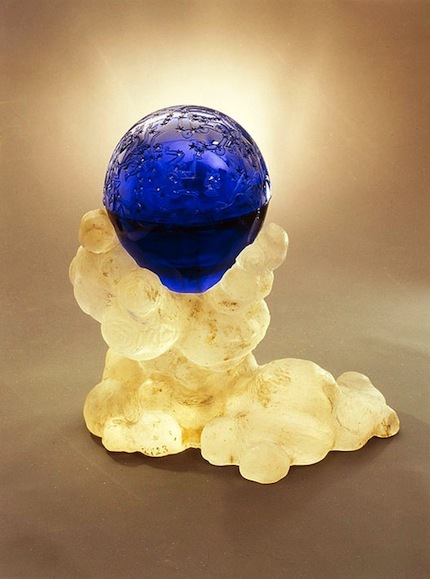 Today, “Fabergé” pieces are some of the world's most expensive art works, sought after by collectors the globe over. The Art Museum Riga Bourse is putting on a small, but exclusive, exhibition that depicts an overview of the magnificent jewelry house's history, which will be open through May 20. The house blossomed into fame under the leadership of Gustav's son, Peter Carl Fabergé (1846-1920), who had been educated in Europe. It was under Peter Carl's management that the first Fabergé Easter Egg was created (1884), as a surprise gift from the Russian Emperor Alexander III to the Tsarina. The egg was encased in white enamel, and inside was was a hen made of colored gold, in which was yet another surprise – a miniature imperial crown with a ruby pendant in the shape of an egg. This item of decorative jewelry was the grandest achievement of the craft in terms of splendor, technical expertise, quality and skill (later becoming a symbol of these qualities), resulting in the Royal Family making the commission of Fabergé Easter eggs an annual tradition. Soon enough, the exclusive, jeweled eggs became popular gifts with everyone who could afford them. The Fabergé family business, which had 100 employees by now, began to expand and establish affiliates in Moscow, Odessa, London and Kiev. More than 50 eggs were produced by the St. Petersburg factory alone. Currently, only 10 of the eggs are found in today's Russia; the rest are scattered among collections throughout the world. A single Fabergé Easter egg can go for more than eight million dollars at auction. 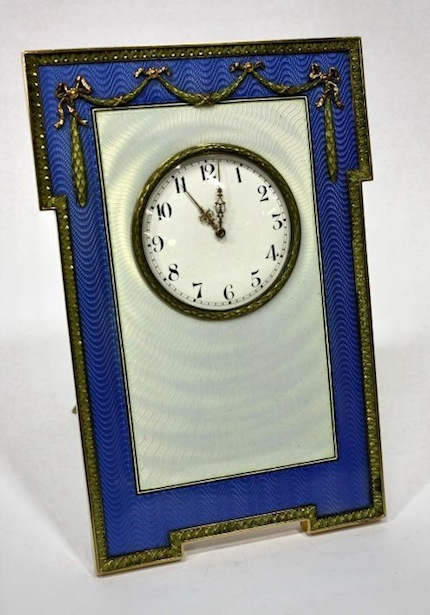 Besides the fantastic Easter eggs, boxes and diamond- and gem-encrusted watches with gold and silver filigree, the Fabergé factories also produced items for the mass-market: various tableware items, decorative pieces and interior elements. The number of items on view at the Art Museum Riga Bourse is not large, yet it encompasses a large-enough selection of work created by the skilled jewelers and contains only unique objects, each of which indicates either an important event or time period for the “Fabergé” company or in the history of the Russian Royal Family; and all of the pieces are exquisite examples of the jewelry house's artistic and technical skills. In his day, Peter Carl imposed a rule that ensured that the company would remain at the top of its field: if a certain model did not sell within a year's time, it was to be melted down. Fabergé worked with sculptors, architects and artists, and demanded that its employees know at least two to three foreign languages. There was another rule that the contracted craftsmen were ordered to follow – all pieces were to be made in historic artistic styles. The works on display in the said exhibition exude marked Jugendstil and Italian Renaissance influences, notably reflected by the use of the ornamental motifs and fine techniques characteristic of those periods. Several Latvian craftsmen have worked at Fabergé, including the painter and graphic artist Jānis Lībergs (1862-1933), and the famous sculptor Teodors Zaļkalns, who worked with intricate and fine moldings. Artūrs Tālbergs, son of the goldsmith Frīdrihs Osvalds Tālbergs from Tukums, also learned his trade from Peter Carl Fabergé. The famous father-and-son jewelers have yet another connection to Riga – they both met their future wives in the city. The Fabergé exhibition is part of the 2010 – 2012 cooperative program between the Ministries of Culture of the Latvian Republic and the Russian Federation. 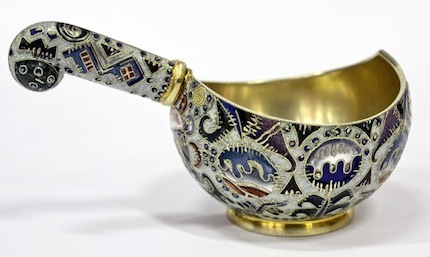 The items on exhibit have been sourced from the All-Russian Decorative-Applied and Folk Art Museum, the State History Museum (Russia) and the A. Fersman Mineralogical Museum (Russia). 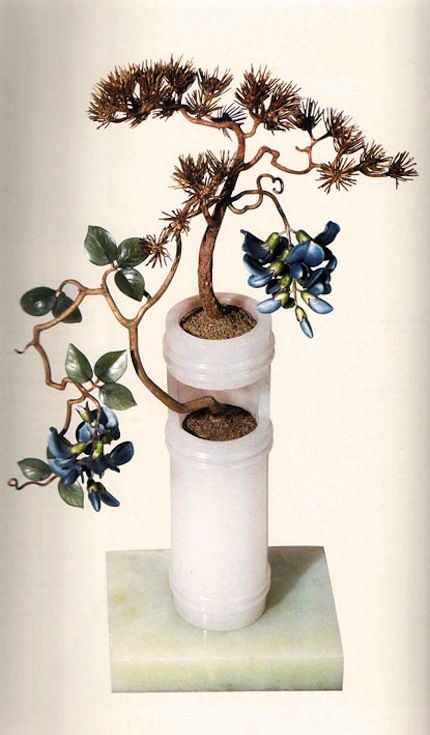 Peter Carl Fabergé himself selected the pieces for the A. Fersman collection. 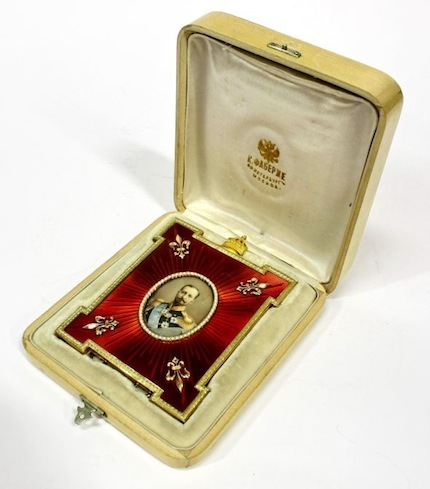 After the arrest of the family of Tsar Nikolai II, Fabergé submitted the last of his works, including the unfinished ones, to the same collection. The show has been augmented with Fabergé pieces belonging to the Foreign Art Collection of the Latvian National Art Museum.